Reptiles make fascinating pets although some common species owned as pets are more for observing than handling. 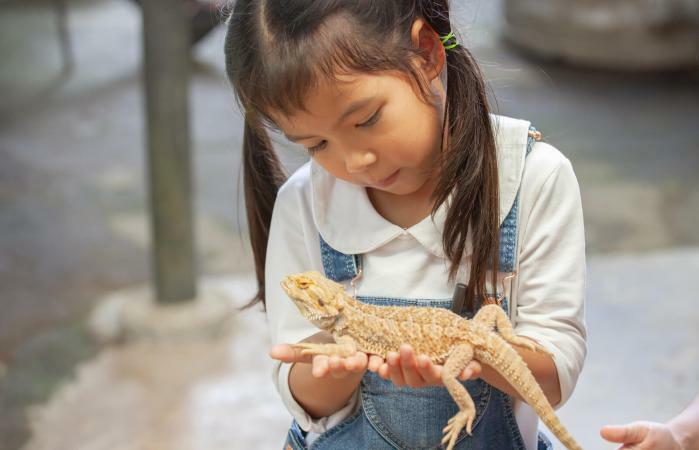 If you're new to reptile ownership and want a pet that you can interact with and handle, there are several good choices. Bearded dragons, or "beardies," are one of the most popular pet reptiles. They actually appear to enjoy being handled and beardie owners will let their scaly friends hang out with them on their shoulders or even find them snoozing on their laps like a cat. They're also relatively easy to care for compared to other pet reptiles. They not only like being handled but in general are quite friendly. Another popular lizard that's easy to care for is the colorful leopard gecko. They are known for being calm when handled, especially if they've been acclimated to it from an early age. Unlike other types of geckos, they will also grow their tail back if it breaks off due to an injury which makes them hardier if you want to handle them a lot. Leopard geckos are small enough to hang out on your hands and some owners enjoy allowing them to roam from hand to shoulder to even sitting on their head. 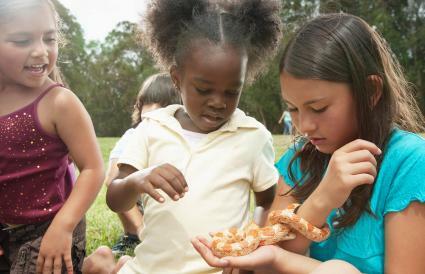 Beginning snake owners are often steered toward the corn snake because of its docile nature. They also don't get larger than six feet in length and their girth is not as thick as that of some of the larger snakes available. This makes them easier to handle even for younger owners like children and teenagers. Chinese water dragons aren't necessarily the best choice for new reptile owners because they have more care requirements including keeping their habitat appropriately humid. They are a good choice though for a reptile lover who loves the look of the iguana but wants a friendlier version. PetSmart list the Chinese water dragon as one of seven reptiles you can "chill with." Not as well known as the more popular options above, the blue tongue skink can be a great choice for a handling-friendly reptile. You do need to acclimate them to it from an early age or they may become nippy. Well-socialized blue tongue skinks enjoy hanging out outside of their tank and spending time with their human. They also are not nocturnal like some other lizards so they're more likely to be awake and open to interaction when you're up and about. Another pet lizard that isn't as well known is the Argentine tegu. These lizards are not only friendly but they've even been described as "dog-like" in their behavior toward their owners. They even can be house trained and allowed to roam your house, though this isn't advisable if you have other pets. They do require interaction though as lack of proper care and socialization can lead to aggression. Ball pythons that are properly acclimated to handling when they're young can grow into adult snakes who are comfortable being handled. They are very calm snakes which is why they're one of the most popular species for pets. Ball python owners enjoy letting their snakes wrap themselves around their arms or waist where they'll happily hang out. Can Reptiles Bond with Their Owners? Reptiles aren't normally thought of as animals with the complex emotional range of a cat or dog. Unlike domesticated species, a reptile hasn't been bred over generations to want to interact with people and display affiliative behavior. However, they can feel primal emotions such as fear, aggression and what could be called "happiness" or physical pleasure. Reptiles that have been frequently handled and fed by their owners can also show behavior that indicates they "know" their owner and welcome interaction with them. Like any other species of pet like your dog or cat, using positive reinforcement and classical conditioning can create a pleasurable emotional response in your lizard or snake. If your reptile knows that interacting with you means food, stroking and things they like, and they're approached calmly with respect for their specific handling needs, they will develop a stronger bond with you over time. When handling your reptile, it's important to observe some general guidelines that are the same across species. Whether your lizard is a small as a gecko or as large as an adult beardie, always make sure that all four of their feet are supported. Depending on their size you may have to use both hands or even involve your forearms in supporting the lizard's body weight. You should also always be aware of where the lizard's head is to avoid scaring them and getting nipped. Never grab a lizard by their tail or lift them this way as many lizards are autonomic which means their tails will come off and depending on the lizard may not grow back. Obviously, snakes do not have limbs, but their full weight and length should be supported which may mean using both hands or your forearms for a larger snake. Use slow, gentle motions when handling your snake and allow them to move onto you from their tank if possible. Many snakes like curling around your arm as if you were a tree branch. Do not allow them to do this around your neck or head as this can be potentially dangerous. Always watch the snake's head as a startled and frightened snake can move very quickly to bite if you're not paying attention. If you're not sure which reptile is the right one for you, visit your local reptile store and ask staff for their advice, as well as your local reptile-friendly veterinarian. You might also look for local reptile clubs in your area via Google or Meetup.com. Make sure you do your research and learn how to properly handle and socialize your reptile from the start to develop a beautiful future relationship.